Christian McCaffrey has speed to burn, and he showed it off against the Titans both rushing and receiving. Despite his ridiculous college production at Stanford, Christian McCaffrey has his share of doubters. Too small to be an every down back, some think. Maybe too slow. 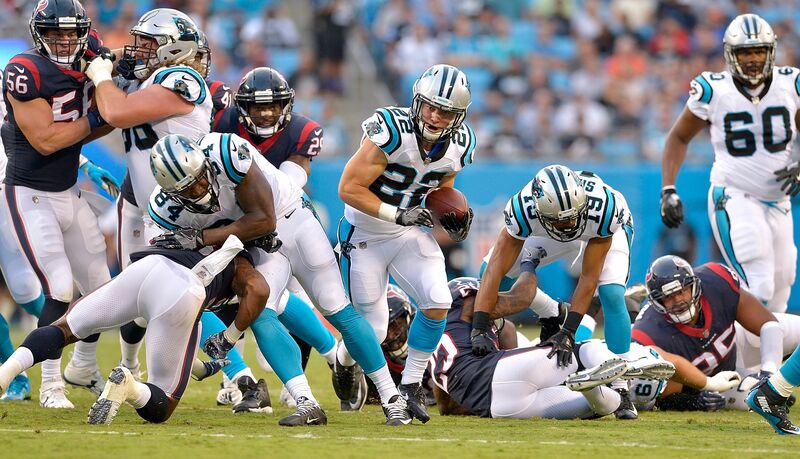 He sure didn’t look that way on Saturday in the Carolina Panthers’ preseason tilt with the Tennessee Titans. In fact, McCaffrey made Cam Newton (who wasn’t in at the time), get excited on the sideline. Watch the burst he showed getting through the hole and outracing a safety trying to come across the field to score his first NFL touchdown. The book on McCaffrey includes his receiving skills, with the thought that he can line up in the slot or even out wide and cause mismatches. But he’s quick and savvy enough to be used on conventional safety valve routes or screen passes out of the backfield and turn them into big gains, as he proved later in the first half. As always, it’s important not to read too much into preseason performances, where rookies often find themselves matched up against non-starters and defenses not showing nearly all of their cards. Still, one big indicator of whether first-year players might be overmatched or take some time to adjust to the NFL is whether the speed of the pro game looks like it has them frazzled. It’s safe to say that isn’t the case for McCaffrey, who looks quite at home making the kinds of moves he made on the college gridiron. If there’s any doubt about what kind of impact he can make in his rookie season, you might want to adjust those expectations upward based on what he’s shown so far.